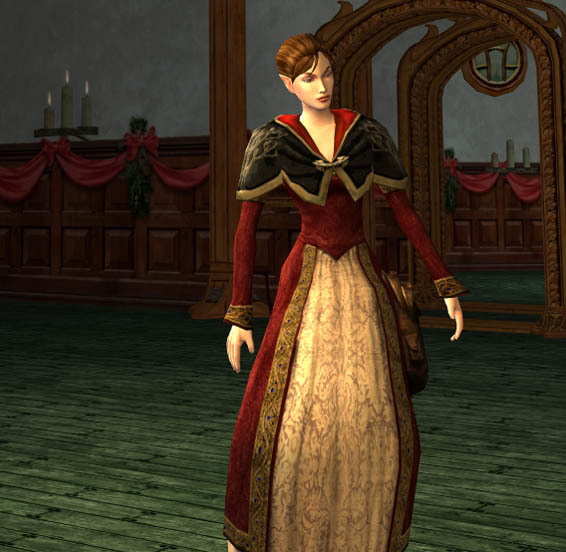 This is a perfect outfit for all those Lotro Holiday events you have planned for the next coming weeks. 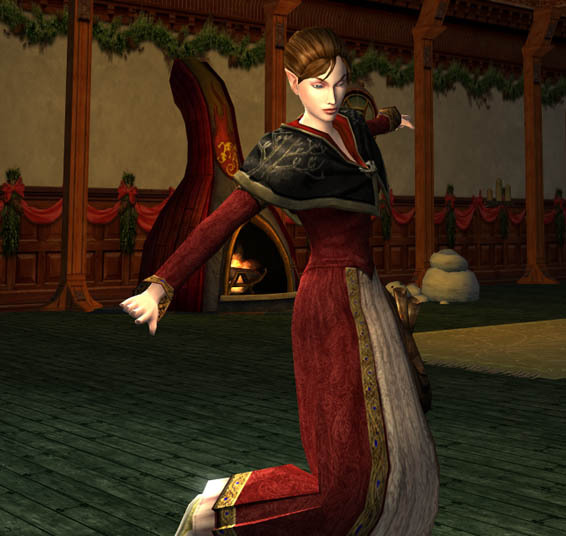 Very festive and elegant. What a lovely outfit! How unfortunate you got a bound item on the wrong account, because most new instance items are bind on equip. On my server there are lots of shoulders on the AH now, even the entire set is pretty easy to get, so I wouldn’t worry. You will surely find it soon! These are indeed lovely shoulders to outfit with and I like the combination with the cap! yeyyy that’s pretty! 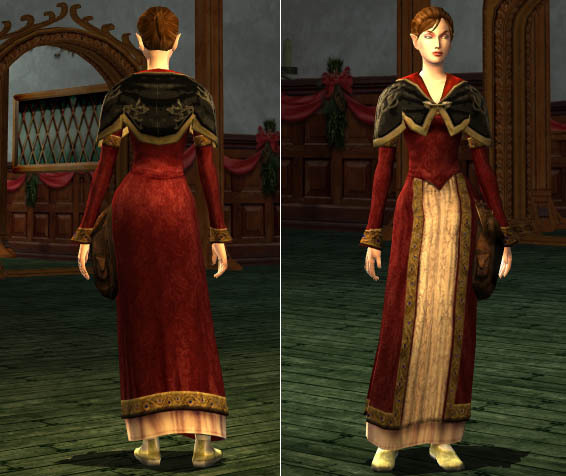 i love the shoulders dyed red and the outfit is truly festive. I wanted to comment because, to my knowledge, you can cosmetically wear items that are bound to different toons through your wardrobe. For example, my main got a Frostbluff Dress of Thanks, and all my alts have been able to wear it from the wardrobe, even though it’s bound to my main. Perhaps this is the result of legacy game constructs, my close friend who is a 5 year player was also unaware he could place bound items into the wardrobe, and all toons across the account could then put them on… even toons that are too low level to wear high lvl armour for example. I might be completely wrong of course 🙂 Your toons certainly can’t GIVE the hat or the shoulders to each other, but if they both placed them in your wardrobe, shouldn’t any of your toons be able to equip them cosmetically? Just a thought. I am REALLY loving your site. Thank you for your comment, I am so glad you are liking my blog 🙂 I actually have two accounts. 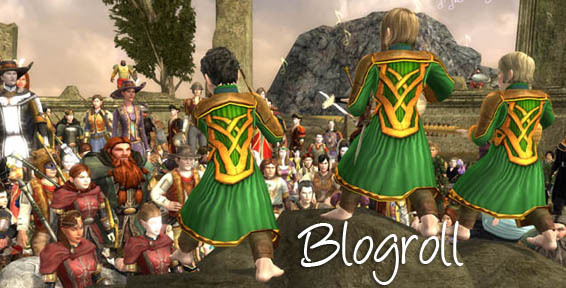 When I first started playing Lotro my husband and I shared an account together. After awhile I started my own account. I still have alts on both accounts. I was just saying I couldn’t share the hat between my two accounts. BTW, your husband is a VERY creative writer. Nice history! 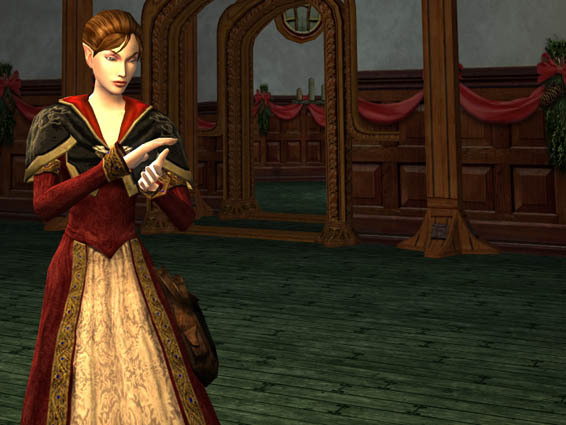 I am Devonna, aka The Lotro Stylist. Find out more about me on the about page or simply follow me on Twitter or facebook.